The World Health Organization (WHO) established its country office in Azerbaijan in June 2004. Currently, WHO is working closely with national partners, engaging in policy dialogue, providing strategic support and technical assistance, as well as supporting the government of Azerbaijan in their efforts to improve health financing and immunization coverage, prevent and treat tuberculosis, manage health emergencies, and prevent antimicrobial resistance. 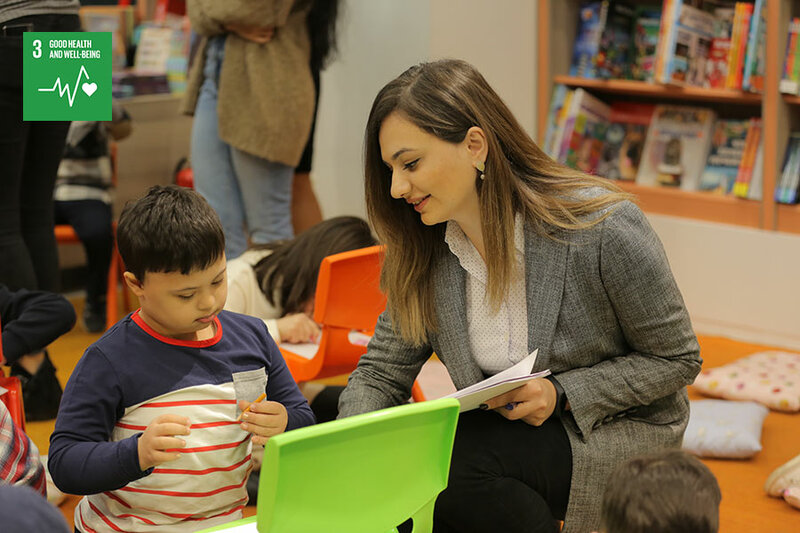 Fanara Bunyadzada, national UN Youth Volunteer with WHO in Azerbaijan, during an event marking World Down Syndrome Day, 21 March 2019. Fanara Bunyadzada, national UN Youth Volunteer, joined the WHO Communications team in Azerbaijan at the beginning of this year, motivated by her belief that "volunteering is the best way to make a positive impact in the society," and by her desire to help people to be more aware about health-related issues. Fanara's assignment responsibilities include developing communication campaigns; organizing events and managing media relations. She also designs and produces content for social media platforms. Prior to becoming a UN Volunteer, Fanara worked as Multimedia Producer at Azerbaijan International Filming Company, where she developed multimedia stories and made editorial decisions regarding the assembly of information, illustrations and content. One of the recent examples of her work is an inspiring event organized in honour of World Down Syndrome Day, marked every year on 21 March. With Fanara’s initiative, the WHO country office organized a story telling session for a group of children from the Centre for Rehabilitation of People with Down Syndrome. During the event, Fanara joined writer Orkhan Adigozal in reading his book "Desires without barriers" to the children. The writer has a disability himself, having lost his ability to walk as a result of an accident at the age of 19. His book shares the important message that individuals with physical or intellectual disabilities should not be isolated from society. They have a lot to contribute and their desires are not limited by their disabilities. Currently Fanara is preparing to launch a campaign for World Health Day, 7 April, which will focus on the importance of primary health care as a foundation for achieving universal health coverage. Within this campaign, called "Protectors of our health", she will interview health workers in Azerbaijan and show the challenges they face, as well as their motivation to work in the healthcare field.